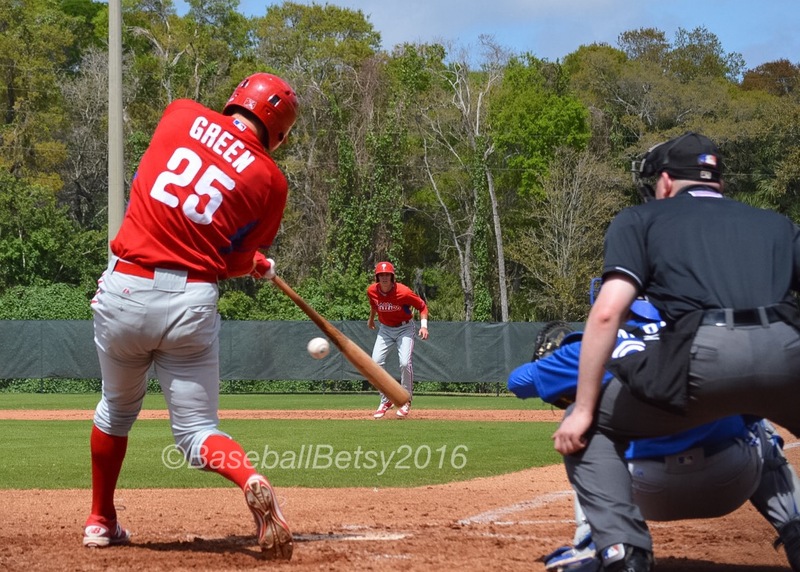 The Phillies AAA squad downed the Yankees AAA guys 3-1 on Saturday afternoon thanks to the tw0-run homer by third baseman Zach Green. Green hit tape measure blast over the left centerfield fence out of one of the deepest parts of Ashburn Field. Watch HERE. It was all that the AAA guys needed to dispatch the Yankees. Green has had a strong spring. It all started when he hit a long home run in the first game of spring training against the University of Tampa over at Spectrum Field. He has continue to hit the ball hard since then when he gets his chances. Green is now in his seventh season in the Phillies organization. He is just 24-years-old on March 7th and looks ready to have a breakout season after battling the injury bug. He could start the season with AAA Lehigh Valley but since he has played little at AA it looks likely he is in line to be Reading’s opening day third baseman. His swing is ideally suited for the ballpark in Reading where the wind always seems to be blowing out and the walls are inviting for any hitter who can lift the ball to the outfield. And can Green lift it up high and deep! Another batter who is hitting well is 2017 Phillies first round draft pick Adam Haseley. He had two RBI hits in today’s AA game. Watch HERE. The left handed hitting Haseley has a line drive swing. In Thursday’s AA game against the Blue Jays. Haseley went 3 for 3 with also two RBIs. In the AAA game, Jiandido Tromp had a base hit and stole a base to show several of his tool set. Watch his steal of second HERE. The battle for spots in the Lehigh Valley and Reading bullpen continues. In the AA game Edgar Garcia pitched two shutout innings. Watch a strikeout HERE. In the AAA game, Ranfi Casimiro pitched an inning. Watch a strikeout HERE. Seranthony Dominguez pitched two clean innings. Watch a strikeout HERE. But the real story in today’s game was the long home run by Zach Green which provided the winning margin in the 3-1 AAA Phillies win. This entry was posted in 2018, March and tagged 2016 phillies spring training, Adam Haseley, Edgar Garcia, home run, Jiandido Tromp, Philadelphia, Philadelphia Phillies, Ranfi Casimiro, Seranthony Dominguez, Yankees, Zach Green. Bookmark the permalink.